At Halloween people love to dress up and stand out, Halloween Contact Lenses can help you achieve the perfect look that you want and put the final touches your Halloween Costume. We stock just about every crazy contact lens there is from the downright scary looking to lovely bright pink but the most popular lenses at Halloween are always the plain white contact lenses which look totally awesome. 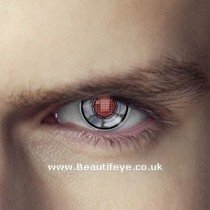 Our range of Halloween contact lenses include terrifying zombie lenses, bloody vampire lenses and the ever popular manson coloured contact lenses range. 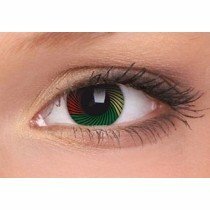 Spruce up your Halloween costume with a great pair of Halloween lenses and be the best dressed at the halloween party! Buy your Halloween contact lenses from Beautifeye for guaranteed delivery on Halloween. Prices start at just £8.99 so what are you waiting for order online today! For an even better look this halloween check out our halloween accessories and temporary lip tatoo's.